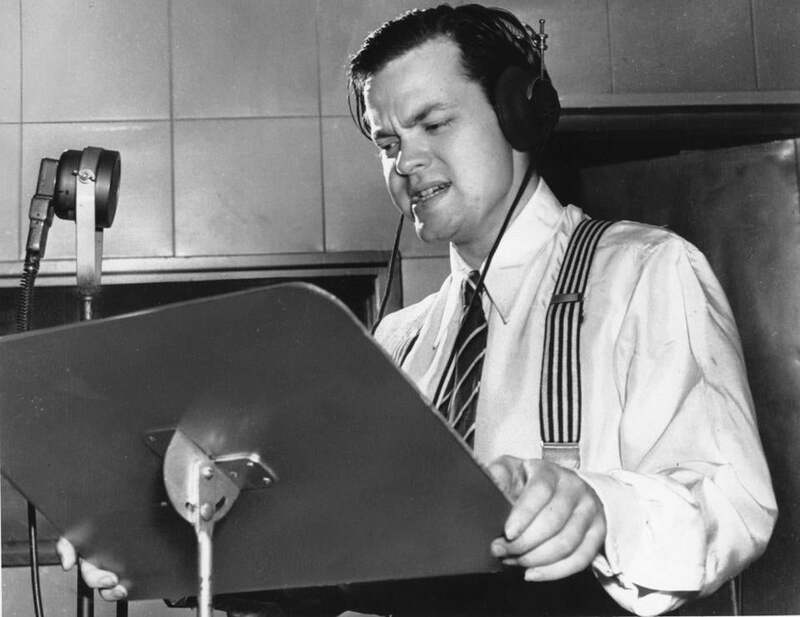 Orson Welles delivers a radio broadcast from a New York studio in 1938. Insurance investigator Johnny Dollar solved his last case exactly 50 years ago today. Hardly anyone in America noticed; they were too busy watching television. On Sept. 30, 1962, “Yours Truly, Johnny Dollar” ended a 13-year run on the CBS Radio Network. It was also the last day for “Suspense,” an acclaimed series of mystery stories that had run for 20 years. And that was that. The Golden Age of Radio had ended. “Johnny Dollar” and “Suspense” were the last two shows from an era that had spanned 40 years, in which drama, comedy, and variety shows filled the radio airwaves and couch potatoes lounged before a speaker instead of a picture tube. “In technical terms, it was the first mass media in America,” said Steve Darnall, a Chicagoan who hosts the Internet show “Radio’s Golden Age” and publishes the magazine Nostalgia Digest. Nationwide networks like CBS and the NBC aired the same programs to radio listeners across the nation, helping to create a unified national culture. Millions of people from Alabama to Oregon tuned in to Amos ’N Andy, Fibber McGee, Orson Welles, and other beloved entertainers. “With the dawn of the radio network, it was possible for all these states and all these towns . . . to share the same experience,” Darnall said. Just as important, radio established the template for all future broadcast entertainment. Virtually all the types of television programming we now take for granted were actually invented to sell home radio receivers, and to keep listeners tuning in. “The sitcom, the drama, the variety show, the soap opera, all of those stemmed from the efforts of early radio programmers to create something that would attract listeners.” said Michael C. Keith, professor of communications at Boston College and author of multiple books on broadcasting. In the 1920s, just as radio sets were becoming commonplace in American homes, radio stations mostly served up live music performances — the recording technology of the time was awful — interspersed with news reports or perhaps the occasional literary reading or religious sermon. But the operators of WGY, a radio station in Schenectady, N.Y., realized they could do a great deal more. On August 2, 1922, WGY broadcast “The Wolf,” an obscure drama by a forgotten playwright, Eugene Walter. It was a major success, and soon radio stations across the country were doing the same. By staging dramas and comedies on a regular schedule, broadcasters could keep listeners coming back. And the broadcasters would earn their keep by transmitting advertisements to those listeners, ads paid for by local businesses eager to sell their wares to the radio audience. It was a superb business model for individual stations, and even better for the nationwide networks like CBS and NBC. These broadcasting giants earned lavish profits, reinvesting much of it in high-quality programs. The best shows featured first-rate scripts and excellent acting. Today’s Hollywood stars rarely appear on TV shows, but shows like “Suspense” routinely featured the biggest box-office giants of the day, including Henry Fonda, James Cagney, Humphrey Bogart, and Cary Grant. At its best, classic radio was rich, diverse, and wonderfully entertaining. It was also doomed. Experiments in commercial television, put on hold by the outbreak of World War II, resumed in the wake of the conflict. By the late 1940s, commercial TV broadcasts had begun in the United States. By 1954, half of all US homes had a TV set. The combination of sound and image was irresistible to audiences and advertisers. While radio dramas and comedies continued, the big money shifted to TV. “The star power from radio began to fade away,” said Darnall. “There was diminished money, there was diminished interest.” As the best writers and actors moved to television production, the number and quality of radio dramas and comedy shows began to decline. It wasn’t a total collapse: Shows like “Johnny Dollar” and the popular Western “Gunsmoke” retained a high standard of writing and acting. But the end was at hand. One by one, legendary radio shows faded from the air, with “Suspense” and “Johnny Dollar” the last to fall. Thousands of episodes of the old shows are still available, partly because the US military recorded and redistributed many of them for troops deployed overseas. Anybody with an Internet connection can find the recordings at websites like www.archive.org. Given the rise of podcasts and audiobooks, have popular tastes for audio drama and comedy simply shifted to new platforms? It’s not the same, said Keith, who thinks that modern audiences lack the imagination to appreciate the style of golden-age radio. “When we lost radio drama and other genres, what we lost was our capacity to construct images in our head,” Keith said. “Television’s not demanding; we plop down on our La-Z-Boy and stare at the screen.” So even if Johnny Dollar came out of retirement, we probably wouldn’t notice.